Around 2002, New System undertook the daunting challenge of plant wide renovations at our Portland headquarters. 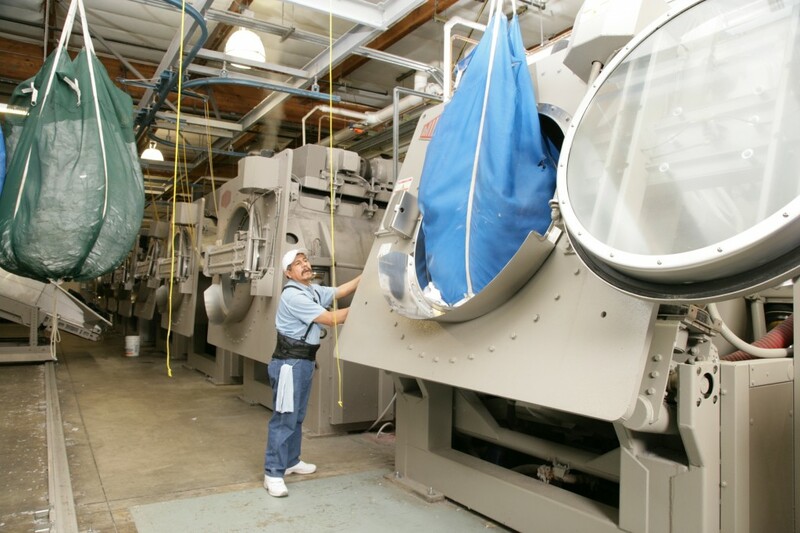 On the plant floor we have seven American-made, Milnor washers; four 450-pound open-pocket washer extractors and three 600-pound washer-extractors were brought in during renovations to help handle the increase in wash volume for the plant. New System also has a pair of 60-pound Pony washers to handle odd lots like floor mats. About Milnor: Milnor, which was established in Louisiana in 1947 by the Pellerin family along with A.W. Walsdorf, now employees more than 500 people and is run by a 3rd generation Pellerin. It was an easy choice for New System to select the Milnor equipment because of their excellent reputation in the industry. As part of the automation of the plant, the new washers are loaded by a Bobco overhead monorail system and uploaded into a Milnor automated shuttle prior to being sent to two 550-pound Milnor pass-through dryers. New System also uses the Mildata computer management system to generate detailed reports on a variety of washroom functions. The flatwork department features Kannegiesser feeder, ironing and folding equipment. New System currently processes about 28 tons of laundry each day. Items processed range from light soil goods, tablecloths, napkins, towels and healthcare linen, to more heavily soiled items such as bar towels, industrial uniforms, mats and mops. Many of these items also require ironing, which we will cover in a later post.